Our world is hurting. Hatred and violence surround us. Our news is dominated daily by discouraging headlines and tales of tragedy. Many people search for a response only to be lost in their natural reactions of anger and despair. The Drive Out Hate Initiative seeks to provide a positive response to the seemingly never ending cycle of negativity. Drive Out Hate’s mission is carry out a comprehensive media campaign which spreads positive messages and inspires thoughtful action. Our vision is a world where community conversations are changed through messages of love and inclusion. 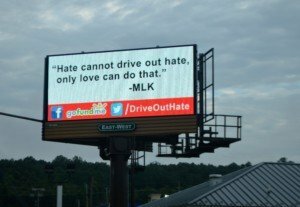 Upon the founding of the initiative, funding was quickly raised for a billboard which displays a quote from Dr. Martin Luther King Jr. “hate cannot drive out hate, only love can do that.” This speaks to the vision of the organization. As support continued, Drive Out Hate purchased two more billboards. Each of these served as a positive presence to the thousands of people that pass them each day. The next step for the organization is to carry out a comprehensive media campaign which promotes the healing values of love and inclusion. The plan is to create material in all mediums and increase both traditional and social media presences. Most of all, the organization hopes to provide a vehicle which drives positive action. Supporters are needed from all walks of life. If you believe that our communities could benefit from a positive message, help change the conversation. Let’s drive out hate with love.